Trimming tall trees and tree branches and be ready to clear away loose material that could be blown around during extreme winds. Having sandbags prepared to block doorways from flooding caused by intense rainfall. Checking and if necessary repairing your house roof, external doors, cyclone shutters and screens. Making sure you know where to turn off your electricity, gas and water supplies. Contacting your insurance company to check you have adequate building and content cover. Having a list of useful numbers to hand including your council, emergency services, insurance company, and the Bureau of Meteorology Cyclone Warning Advice Line (1300 659 210). Preparing a Family Cyclone Plan including what you and your family would do and what you might need in the event of a cyclone. Making an emergency kit including battery operated radio, torch, non-perishable food and water for four days, key personal documents and essential medical supplies. Contacting your Shire office for details of the community pre-season clean-up. Identifying a suitable refuge that is safe from wind damage and storm surge. Talk to your builder about strengthening part of your house. Deciding where to shelter your pets. Making tie-down points for boats, caravans, trailers, garden sheds and water tanks. A cyclone may produce gales within 48 hours. The community should commence taking precautions. Keep up to date with the development of the cyclone through radio, television or internet (www.bom.gov.au). Identify any loose material and rubbish around your property and consider time and methods of removal or securing. Check your emergency kit and organise supplies including first aid kit, personal medication, torch, portable radio, spare batteries, canned food, drink water containers, appropriate cash supply and spare car and house keys. Make sure your car is full of fuel. Ensure you have adequate tie down materials and anchor points. Purchase supplies if necessary. You should try to have a barbecue or portable stove at hand for use outdoors in a dry, ventilated area, in case the cyclone cuts out electricity. Ensure your family is aware of cyclone procedures. Consider relocating people with special needs such as late term pregnant, elderly or infirm people who may require special support. Identify a safe place for your pets (most welfare centre’s will not accept pets, except guide dogs). There is a significant risk that destructive winds will occur in your area and you should take action. Continue to monitor radio, television and/or internet (www.bom.gov.au) for announcements on the cyclone’s progress. If you live in a low-lying coastal area and the cyclone is likely to create a storm surge, evacuations will be recommended during Yellow Alert. Refer to your evacuation guide. Prepare to move rapidly to the strongest part of your house or closest welfare centre if required. Store or secure loose material and items likely to be dislodged by destructive winds. Securely fasten all cyclone screens into position. Secure boats, trailers, garden sheds, rainwater tanks and LPG bottles to tie down points. Know the whereabouts of your family members and pets. You may consider sheltering pets early. Ensure emergency supplies are in order as identified in Blue Alert. Fill emergency containers with water. Check that your vehicle is full of fuel and refuel if necessary. Destructive winds are likely to occur very soon and you should move immediately to shelter. Continuously listen to portable radio for announcements on the cyclone’s progress. Go immediately to the strongest part of the house or closest welfare centre. Park vehicles in the most sheltered area available with handbrake applied and in gear or shift in park position. Stay away from windows and doors, keeping them all closed. Remain indoors until you are advised that the cyclone has passed and the ‘All Clear With Caution’ is given by the emergency services. The wind and storm surge danger has passed, although ground hazards may still exist. Continue to listen to radio/television for public information announcements. Only proceed outside with caution. Check for ground hazards such as downed power lines, fallen trees, broken water and sewage lines, loose roof sheeting and debris. Check to see if neighbours are all right. 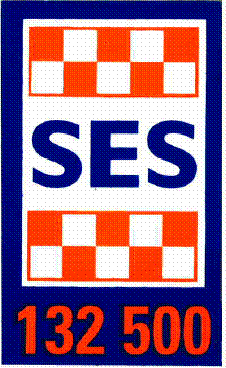 Report any injuries or dangerous situations to SES. Commence clean up of immediate area. Stack debris clear of water meters, valves and telephone lines. Avoid using the telephone, except in emergencies. The Bureau of Meteorology and the State Emergency Service (SES) will issue various warnings through the media during a cyclone. ‘Cyclone Watch’ announcements will be issued through radio and television by the Bureau of Meteorology when there is a risk that a cyclone will produce gale force winds within 48 hours (but not within 24 hours). FESA SES will issue Community Alerts during the Cyclone Warning period. Community Alerts advise of appropriate actions to be taken by the public as the cyclone come closer. The alert stages are divided into BLUE, YELLOW, RED and ALL CLEAR WITH CAUTION as indicated in this pamphlet. Alerts are issued through radio and television and are displayed in communities using coloured lights or flags. Community Alerts may not be issued for Category One cyclones in some areas of the State. It may be necessary to evacuate some areas, such as storm surge threatened areas, before the cyclone arrives. If advised to evacuate, follow directions from Emergency Services; lock your house; switch off electricity, gas and water. Take a torch, sleeping bag, important documents and any necessary medications with you. Wear long sleeved shirts, long pants and sturdy footwear so you can be protected as much as possible. If staying in your home, move to the strongest part of the house. If the house starts to break up, protect yourself with mattresses or get under a strong table or bed. It is essential to turn off all power and light switches during a power cut to enable electricity authorities to re-establish power supplies efficiently and give added protection to your house in the event of damage. Disconnect gas to avoid gas leakage should your pipes be damaged during a cyclone. Do not stand near or open any windows or doors during the cyclone. Cyclones are given a rating of severity to indicate their intensity. Should you require assistance at any stage, please contact the State Emergency Service District Office or your local SES unit.